The TSC TTP-246M Plus die-cast barcode printer is designed to meet the most demanding identification and labeling requirements at an affordable price. It features a user-friendly 6-button display and side-load design, standard serial, parallel and USB connectivity and optional Ethernet networking for simple integration with other devices. Optional 300 dpi capability is available either from the factory or as a field upgrade. An upgrade kit, which includes a printhead with firmware, takes 30 minutes to install. The TTP-246M Plus is packaged with TSC's powerful TSPL-EZ firmware, which supports three printer languages: TSC printer language, TPLE (Translation Printer Language Eltron), and TPLZ (Translation Printer Language Zebra). TSPL-EZ features internal scalable True Type fonts, along with a BASIC interpreter with file manager for creating powerful printer-interface applications with multiple host types. 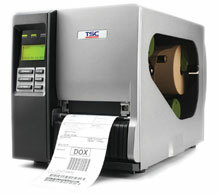 99-024A002-00LF TTP-246M Plus, Industrial Thermal transfer barcode label printer, 203 dpi resolution, standard serial, parallel and USB connectivity, 4MB Flash, 8MB SDRAM memory, Real-time clock, 8 ips print speed, 4.25" print width. The TSC 99-024A002-00LF is also known as 99-024A002-00LF or 99024A00200LF	.